The long legged doji on yesterday daily candle chart is confirmation of the inherent tension in this currency pair at the moment. With the body of the candle closing below the 9 and 14 day moving averages and with the upper leg having penetrated both during the day. Clearly the market is indecisive. Had this signal appeared following a significant bull rally or bearish reversal then we could have taken this as a strong sign that the trend was reversing and therefore providing us with a possible trade. However, in the current confusion of the sideways consolidation the candle has far less meaning and my advice remains the same as yesterday – in other words we need to see a decisive break above 99 or even 99.40 for a break to the upside and if prices today fall below the moving averages again then clearly the bearish sentiment still remains in place. 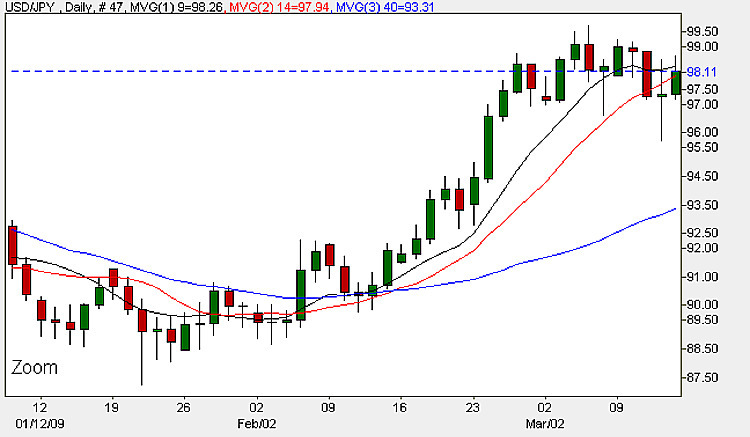 Any potential downside trade for today could be entered at 97.90 with a stop loss above at 99.55. The main fundamental news is due for release in the US later this morning with the trade balance figures up first, closely followed by import prices and the University of Michigan sentiment number. A more detailed explanation of these can be found at my euro to dollar site.